Tidbit of the Day: Being a nerd when it comes to political geography is a requirement for my line of work, and by extension, so is knowing the various counties. Texas has several that stick out. There’s Jim Hogg and Jim Wells Counties near the Rio Grande in South Texas. But there’s also Deaf Smith, Texas in the panhandle. The county, pronounced “Deef,” was named for Deef Smith to honor his role in the Battle of San Jacinto. It has fewer than 20,000 residents and proudly calls itself the “Beef Capital of the World.” It is also very Republican – Donald Trump took 69%. Late Friday, a three-judge federal panel struck down four districts in the current Texas Congressional map. Specifically, the judges concluded that the Lone Star State had discriminated against minorities when drawing the lines that have been used since 2012. Consequently, unless the Supreme Court reverses the ruling on a certain appeal, three of the four districts will have to be redrawn prior to the 2018 elections (I’ll explain why only three). The fact that the judges came down against Texas was not a surprise. The fact that it took so long – more than five years, was a different story. Three cycles have passed using lines that are unconstitutional and yet judges held up the process not by ruling yea or nay – but by turning a deaf ear and not issuing a decision at all, despite pleas from both parties. The ruling itself, a 2-1 decision, sided with plaintiffs who argued that the state discriminated against African-American and Latinos when drawing the districts. Minorities had made up 87% of the state’s growth over the last decade but minority group sued, claiming illegal packing districts, grotesquely stretching areas to do so, or placing “higher-turnout Angloes” that put Latino precincts that typically had fairly low turnout in high turnout Anglo (and likely conservative areas). 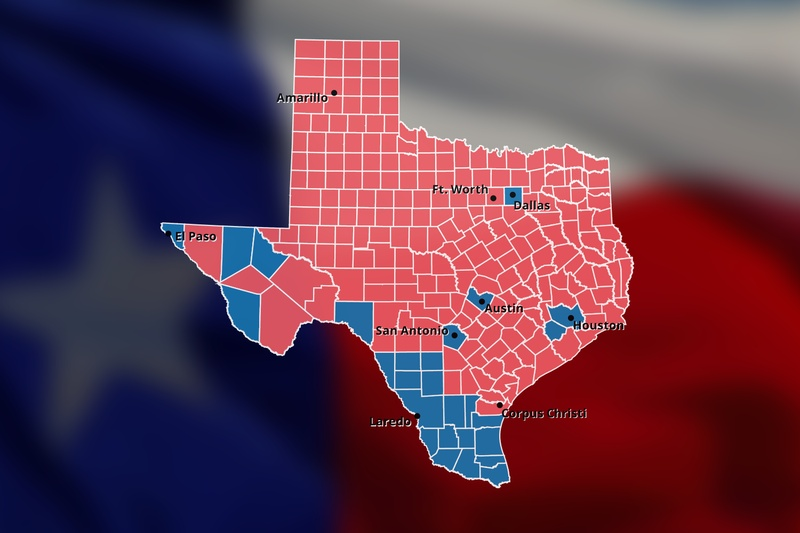 A number of those districts are connected by what has become referred to as “fatija strips,” meaning some of the district lines are basically a sliver encompassing Anglo populated areas in order to draw Latino precincts into a single district. The district held by Democrat Lloyd Doggett, the 35th, is one example. His Travis County (Austin) base was drawn all the way to Bexar County (San Antonio) so that map-makers could justify creation of a Latino district. Doggett’s district was among those shot down. So was the sprawling 23rd district which stretches from Bexar (San Antonio) to near El Paso. Referred to as the only genuine swing district in Texas, it is held by Republican Will Hurd. Judges also said sianoro to the 27th district, held by another Republican, Blake Farenthold. The fourth district struck down was the 26th district, held by Republican Mike Burgess. However, that was from the original 2011 map and because the state and plaintiffs compromised in 2012 (the defendant at the time was Attorney General and now Governor Greg Abbott), a new Latino district was created in the Dallas-Fort Worth area. This district was ironically won by an African-American and the matter was ruled moot. Republicans will appeal the case to the Supreme Court – Attorney General Ken Paxon already said as much. But despite the prospect of losing up to two seats (though my view is only one is certain), the ruling may present the party with unexpected opportunities. If the Republicans were smart and not greedy, (they won’t be) they’d use the remap as an opportunity to purge or weaken incumbents or seats that might come open in order to protect others – and not have potentially worse losses in a potentially unstable midterm. For instance, Farenthold has had a number of rendezvous with tempestuity during his tenure and so the GOP might not have qualms about giving him a more difficult district. On the other hand, Hurd is an extremely well liked up-and-comer whose CIA background has meant high national visibility in the wake of Trump’s dealings with the CIA. But saving both might be next to impossible without creative penciling – and that’s what got the grand old party into trouble before. Hurd’s initial 2014 win was an upset over Congressman Pete Gallego and his ability to beat Gallego a second time by roughly the same margin was heralded as a major accomplishment. The genesis of that survival was taking Bexar by nearly 13 points while getting stomped in the rural areas where Gallego was mega-popular. Bing, bang, right? Well, maybe not. Given that Doggett has thwarted at least three Republican attempts to beat him, they’d be smart to simply give Doggett a Travis based district. More importantly, they might have little other choice. That would free up Travis precincts from Mike McCaul and Lamar Smith, which they lost by huge margins in ’16 (and I’m assuming other elections) anyway, even while winning district-wide by resounding margins. Hurd on the other hand could get more of Smith’s portion of Bexar while losing some of those rural counties that Gallego won to a district that would also contain the Bexar portion of Doggett’s district. This would be the nucleus of a new, Latino, district that would likely elect a Democrat, making that their first new seat. Republicans could try that but they’d be hard to justify the reduction of the Latino percentage in Hurd’s new district. So they might opt to give Hurd more Latino precincts – but that would weaken his already precarious hold. One saving grace for Hurd might be a potential retirement by John Carter, 75 because in theory, with creative – but legal boundary drawing, his district could be eliminated and spread to others that range from suburban Austin to San Antonio. Carter has Williamson County which contains some of the fastest growing communities in the nation – Round Rock, Georgetown and Cedar Park. The remaining exurban community among this quartet of the fastest in that area, San Marcos, is in Smith’s district in Hays County. But because much of this turf leans Republican, shifting them among the five or so districts that encompass that area might free up other equally friendly turf for Hurd. The problem is a Carter retirement is not imminent. Farenthold’s seat (anchored by Nueces County which is Corpus Christie) will also have to become more Democratic – and it’s not impossible that in a Trump midterm, he too can be dislodged. But while shifting areas from the neighboring 15th, 34th, and potentially the 28th on the Rio Grande might make the district more competitive, the district might be Republican enough so that a Farenthold or another Republican loss is not inevitable. Republicans might also use the opportunity to shuffle around some of retiring third district Congressman Sam Johnson’s precincts. It is fairly red but unpacking it just a little would keep it safe (presumably for State Senator Van Taylor) while also seeing Marchant and Sessions through the decade before the next redistricting. A retirement by Kay Granger, whose base is Fort Worth, would also help the party deal with this dilemma. Helping Culberson might be tougher but every little Republican sliver they can find means more the Democrats will have to find. One thing to bear in mind: the districts will have to be drawn at 2010 population, which means the massive growth in the direction of one party or another would be uncontrollable might complicate efforts to “shore up” specific districts. In closing, Republicans will certainly have more to lose in Texas in 2018 than previous cycles. But much maneuvering awaits before the deck is stacked against anyone.